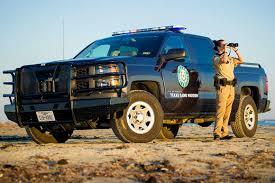 Texas Parks and Wildlife Department law enforcement compiled the following reports. A Harris County game warden was checking for saltwater fishing violations from the shoreline when he observed two men fishing underneath the Texas Highway 146 Bridge in an area marked with “No Trespassing” signs. Upon contact, the warden could smell the odor of marijuana. He asked the subjects for fishing licenses, and neither possessed one. When asked if they had any weapons or illegal narcotics on them, one hesitated and glanced down at his front waistline. Suspecting a gun, the warden placed the individual in handcuffs for safety and conducted a pat-down search, which revealed a semi-automatic pistol with the serial numbers scratched out. The warden also discovered a small amount of marijuana. Upon further investigation, the warden found that one of the men possessed a fake resident card as well as a fake social security card. U.S. Customs and Border Protection was contacted to confirm the status of the individuals. They arrested one subject for unlawful carrying of a weapon. Felony charges are pending with Customs as well as deportation, pending trial. In May, Harris County game wardens were stopped by a Spring taxidermy shop for a compliance check. In the course of inspecting several trophy white-tailed racks, one of the wardens discovered two sets of antlers allegedly killed by the same eight-year-old hunter. The heads had been turned in by the father, but reported under the juvenile’s license. Further investigation revealed the father had advised the taxidermist he had killed one of the bucks, but the wardens found no record of the individual possessing a valid hunting license for the year in question. Subsequent contact and interviews with the father and son confirmed the father had, in fact, killed the trophy buck in Val Verde County without a valid hunting license. They cited the father for hunting without a license, and civil restitution for the whitetail buck is pending. On June 9, a Gonzales County game warden received a tip that someone may have shot a white-tailed doe during or before a grass fire started in the southern part of the county. Armed with details about a vehicle that had burned in the fire, the warden pieced together information that led to a group of hog hunters who had entered the field, where one of them shot a white-tailed doe. At some point, after the person shot the doe, the hunters’ vehicle caught the grass on fire, along with their pickup. Cases filed include hunting without a valid license, taking white-tailed deer in closed season and civil restitution. Assistance from the Nixon-Smiley Police Department was paramount in the investigation. On June 16, a Johnson County game warden was about to launch his patrol boat onto Lake Pat Cleburne when he observed a car parked near the boat ramp, facing the water. Being a popular area for bank fishing, the warden approached to check for fishing compliance. Instead, he found two unclothed individuals inside the car and, in plain view, a glass pipe with an off-white substance commonly used to smoke methamphetamine sitting on the center console. Both subjects were ordered to put their clothes on, and he removed them from the vehicle. The warden discovered various drug paraphernalia and narcotics. He arrested both individuals. The cases are pending. A Val Verde County game warden was patrolling near Langtry when he made contact with two groups of out of state reptile hunters. The non-game collectors were found to lack the required reptile/amphibian collector’s permits. He also educated them on Texas laws about hunting from a public roadway. Appropriate charges were filed and are pending. Navarro County game wardens responded to a call of a possible vehicle submerged in a flooded gravel pit. First responders found evidence that a dump truck had gone over an embankment and into an old flooded gravel pit, which was 35-40 feet deep. Wardens noted a small oil slick was forming on the surface of the water, called for a dive team and launched their patrol boat. The Waxahachie Fire Department Dive Team arrived on scene and located the missing dump truck. Divers entered the water and found the dump truck resting upside down with the driver still in the cab. The driver did not survive. Game wardens patrolling Choke Canyon Reservoir on Father’s Day weekend for water safety and fishing violations came across information someone might be alligator hunting on the lake. The wardens went to the reported location and found two men sleeping in their truck. Upon questioning, both men confessed to having set out eight baited lines to catch alligators. Both men stated they were not clear on the regulations and didn’t know they were doing anything wrong. The officer discovered several other violations during the investigation, including undersized catfish and no fishing and hunting licenses. All lines were picked up, and they caught no alligators. Several cases are pending.